Rare Pepe has been a meme for over ten years now, but now Pepe has found his way to the blockchain and it is revolutionizing cryptocurrency! There are plenty of cryptoassets out there, but these Rare Pepe cards are the beginning of something huge. 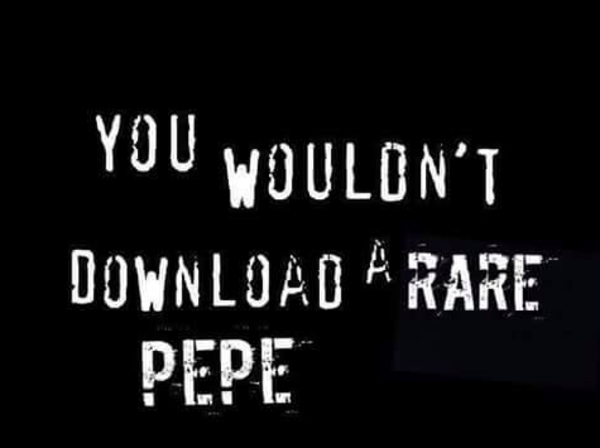 People are taking their creative efforts and turning them into digital versions of physical goods, so these rare Pepes are truly rare! At the time of writing, there are ten series of cards. If you would like to buy any for your collection, go to Rare Pepe Wallet and look through the cards, or you can search of course. Some are rarer than others, and a few are worth quite a bit, such as RAREPEPE (Nakamoto Card) from Series 1. Cards for sale are listed on the exchange for either XCP (Counterparty) or PEPECASH. You could steal this image, but it's only a copy of the real NYANPEPE! These cards are similar to Deckbound or Spells of Genesis cards on the blockchain, except they're created by random people instead of one company. There is a game in the works for Rare Pepes! It is called Rare Pepe Party and is currently in alpha. It uses RAREPEPEPARTY assets. More details are coming soon. I had some ideas for the game before I knew it existed. One of them is that for each card, the description under its asset info could have errata, or later rulings, like what Magic: the Gathering does. Some common traits that these cards have are attack, health, speed, and element. The rest is just literally anything. NYANPEPE is the first Rare Pepe I created and have listed at Rare Pepe Directory. There are only 4,200 of them in existence and there will never be more. 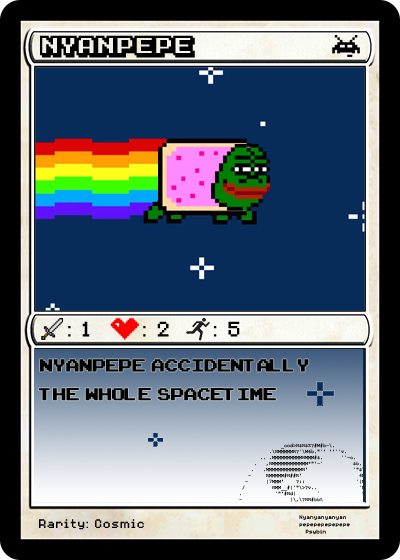 The errata on NYANPEPE could be something like, "When NYANPEPE comes into play, (to stay away from MTG's battlefield keyword) destroy all other Pepes in play." ERISPEPE was done with oil on canvas and is my only Rare Pepe that was created in a physical medium. I may be auctioning it off at the WTH Auction House (more info here) in the near future (as of 12/19/07).